10am - Reader Sue directed a comment to me for clarification of my Blogging about stopping eating once you don't feel hungry. I understand Sue's not getting this thing. Because this eating thing is the result of something else. And that something else is: The Bottom Line! It is becoming sensitive to what is going on. It is becoming sensitive to what you do. And specifically, to Sue's question, "It is becoming sensitive to how you feel as you are eating. Sensitive to your hunger." With each forkful of food, you must question of yourself: "Am I still hungry? Am I full now?" Sue's question asks about food. But food is just one thing in a Universe of things that may bring success in everything taken on. But that level of success is completely dependent on each person's talents. Each persons level of ability. And especially, each person's level of discipline! I am addressing in this Blog post, a concept that is huge. Almost impossible to get under your belt. But here is the Bottom Line of this idea. The Bottom Line of this concept. Slow up. You have got to be aware of everything that you do. You must go slow enough that you are aware of every single thing that you do. At every second. You reach into the fridge for something. Your wife says something to you. You lose your awareness. You are now no longer completely conscious of what you are doing. You get hold of the can of soda that you were reaching for. But then, you accidentally knock out of the fridge and on to the kitchen floor, a pot full of soup. All over the floor is the soup that your wife had prepared for supper. You look skyward and say to whomever is listening, "G-d,dammit! Sh-t!" In your mind, you are not responsible for the soup spilling from the fridge to the floor. Q: What happens when you are going slow? When you are aware of what you do? Second by second? When you are conscious of your hand as as you reach into the fridge for the soda? A: The pot of soup, prepared by your wife for supper, will remain in the fridge. Am I able to lead you by holding your hand. Guiding you. Cautioning. Advising. No. Understanding the Bottom Line of this concept is a do-it-yourself learning experience. But.....I am here for you if have a question and/or would like to make a comment. We have assembled 5-drawers. Two 7-1/4" deep and the two 4-1/2"deep. Also one 3-1/2" drawer. Little Honda will have two cabinets. Both identical. 7-drawers in each cabinet. 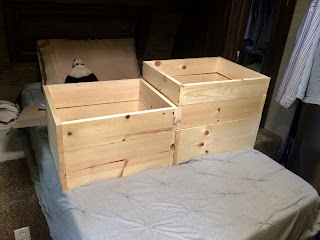 Each cabinet will consist of  7-1/4" deep drawer. 4-1/2" deep drawer. The cabinets shall be installed, back to back. Mounted behind the passenger and driver's seat. Secured in place on a 1/2" plywood floor. That's a very helpful reminder George. I don't normally knock things out of the fridge, but I very definately do not think about how much food I'm shoveling in with my fork! Who does think about how much food they are shoveling in with their fork? One way to deal with this is to limit how much gets put on the plate at serving time. Then even if you forget to pay attention while you're eating, you still stop when the plate is empty! I put a lot less on a plate now than I used to do. I just recently decided I need to quit mult-tasking after some huge mistakes made in 2015 and 2016. Slow learner here. But I'm working on it too. Meditation has helped. I think it was Time magazine that recently had an article on mindfullness. Might want to check it out. Thanks for sharing how you are learning this art of concentrating when you are doing something. Also for the heads-up on Time Magazine. A few years ago, I had irritable bowel syndrome. It was embarrassing to be at a restaurant with a friends and have to make multiple trips to the bathroom. So I cured myself with something similar to what you are doing, and I have very slowly lost weight. I am never really hungry, and I do eat whatever I want to eat--no "diet" for me. Now, obviously, this is easier for me because I live alone and do not have to prepare meals for other people. Some people call this "grazing" but it is more purposeful than that because "grazing" sounds like you eat whatever you find at that particular moment, which is not what I do. Not many are able to do what you have succeeded in accomplishing. By your own will and determination, you now eat less food. Very hard to do. But you did it! At 24 Hour Fitness where I workout, there are sooooo many overweight members on the cardio machines! Trying to exercise off a weight loss. PS: What is this yellow face guy with the smiling face got over his head? A halo? If it is a halo, must be me! I really started doing this to reduce my irritable bowel symptoms, which got worse whenever I ate too much at one time. The weight loss was really incidental, and I do eat whatever I want, just not a lot of it at one time. I past years, when I tried to eat less food but at regular meals, I always got headaches from being hungry, but this method seems much more natural to me than restricting what I eat to low-calory foods. At the most I eat two meals a day. I do a small breakfast about 12 noon or a little after, supper between 5-6 pm. No snacks just hot drinks in between i.e. tea or decaf coffee. I have no health issues knock on wood but I am a tad over weight. I feel great. I do weight lifting, walk, and bicycle every other day. I believe that the food thing that you are doing is dieting, You seem to be successful at it. And you are to be congratulated. Because so few are any good at it. Hi George, it seems your readers are eager to discuss food and weight and the philosophy behind your conscious/mindful eating here in your comments section! If you're ok with that, I sure prefer that to a private email conversation. It's great to read different people's approaches to what has worked for them. I hope you understand that I have no disagreement or question or issue with the limiting of meals to small amount or to the stopping of eating when noticing there is no more hunger. I'm all for that and I cheer you for becoming aware and then changing your habits! My question was only about how you dealt with the timing of when the hunger comes back (which happens sooner when your meal was smaller than it used to be), and what happens if hunger comes back at a time that isn't good for eating (for me that would be evening -- for you it might be when you are getting ready to go exercise, or do other things). Actually, I do not think of timing the eating of my food at all. I eat whenever I feel the need for food. And I stop eating when the feeling of needing food goes away. Just so that you understand, that for me, when to eat has no meaning. Because I have developed a keen sensitivity for when I need food. And when I have had enough food. Q: "What happens if hunger comes back at a time that isn't good for eating? :"
A: I eat some peanuts or some cookies or some other handy food. I always have a jar of peanuts in the Honda. Sometimes when I'm away from home at breakfast, I get an Egg McMuffin. I have no eating rules. Just sensitivity. BTW Sue: I use this sensitivity discipline in every single part of my life. Very, very, very difficult to always be aware. Pays huge dividends! Thank you George. You have answered my question and I appreciate it. George... I have followed your blog for many years. I am so amazed by your level of awareness on many topics.Many Blessing to you, I hope you continue to blog forever. Your "many topics" comment is a fabulous compliment, Tom! Thank you! When I went to school, most of my friends were high achiever types. Scholarship Society, etc. Socially, my friends debated for fun. We read for fun. Whenever I did not know what a word meant, I had a deal with myself to look that word up in the dictionary. I bought myself a set of Encyclopaedia Britannica when I was a teenager. Earned that money working at "Frank's Market" in City Terrace [A neighborhood in East Los Angeles]. I love to Blog, because I love to write. Won't ever quit being a Blogger! Hey George, remember the book: "The Unteathered Soul"?